At La Gelatiera we seek to make meeting and eating a fantastic experience. Our Artisan ice cream has consistently won some of the UK's most prestigious food awards and having established our proven business model we now know it's the right time expand to more shops. The investment will allow us to do this starting with our new Stratford shop. We seek to make eating and meeting for a gelato and a coffee a social occasion for all seasons in a great environment. We are young, modern passionate gelato lovers, inspired by bringing a modern Slow Food twist to our family heritage of artisan gelato-making. We hand-make everything fresh daily using the best seasonal ingredients and organic dairy produce. For Antonio the maestro, it all began when he was a boy living in Calabria in southern Italy. His grandfather was a gelato maker before him, and he is tremendously excited to carry on the family tradition at La Gelatiera. The name La Gelatiera refers to the traditional gelato churn used originally by artisans to make gelato. We chose it because we are passionate about the craft involved with making the best gelato. We want to share everything about our gelato and so we even ask customers to visit our laboratory inside our shop to see La Gelatiera in use. Here you can watch the gelato churning process, and have your coffee made on our unique Victoria Arduino Leva machine before relaxing in the handcrafted shop furniture constructed from reclaimed materials. The unsurpassed quality of our gelato is a result of our carefully chosen ingredients, genuine craftsmanship, and the science and creativity of our maestro and co-owner Antonio. To ensure freshness and quality, our gelato is made fresh daily on the premises, in small batches, using our original recipes and traditional process called Mantecazione. Our gelato is 100% natural and free of any additives or preservatives whatsoever. We also go the extra mile by using raw Jersey Cow milk and cream from one of the country's best local dairy. We pasteurise our dairy ourselves in our premises to keep all its freshness and goodness. Our home made gelato and sorbet bases are also egg and gluten free and made fresh every day. Low glycemic index (GI) range coming soon. The result is a gelato that is packed with flavors, refreshing, rich in vitamins and healthy nutriments, and low in fat (0% â€“ 6%). It has never been so good to be healthy! We also offer a large choice of non-dairy and vegan flavors all made with Love. Our flavours of artisan ice cream range from sea salted caramel to one of our award winning ice creams the Cornish blue and walnuts, which is a fantastic marriage of a gentle award winning cheese and caramelised walnuts. We have something for everyone to enjoy. Overall it's not just our customers that can't get enough of our incredible gelato and sorbet, the judges of the Great Taste Awards 2015 have ranked two of our products in the Top 50 Foods for the 3rd year in a row. This year both our Hazelnut IGP gelato and the Sicilian Pistacchio sorbet are making the Top 50 list out of 10,000 products entered. 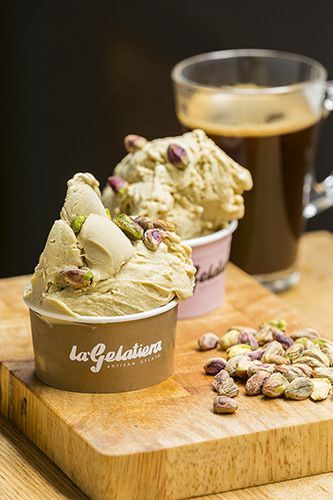 But really it is our Sicilian Pistacchio sorbet number that stole the hearts of the judges of the Great Taste Awards this year also winning the ultimate Golden Fork for London and South East (aka London's best food). Overall the GTA judges have awarded us a total of 25 coveted gold stars across 14 of our fantastic products, including five 3 gold stars, plus 4 Top 50 Foods and 2 ultimate Golden Fork for London and South East. The first part of our expansion plans will start with our new shop in Stratford within the Olympic Village, which is due to open spring / summer 2016 and we are looking for investment to make sure we are in the best possible position to create an impactful launch and also allow us to work on the shop opening during the quieter winter months with out too much strain to the business cashflow. Q. I would also like to see historic accounts please. Also note that the front page of the opportunity states "Medium Risk", however when drilling down, the Duedil score indicates "Very low risk". Q. Hello, could you send me your accounts from the past 3 years and your forecast for the next 3 years? What normalised margin are you looking to achieve? Do you have a long-term return on capital that you want to achieve? Any more exanpansion project? Q. Hi, could I get the financials for the past 3 years and growth forecasts for the 2016/17 based on two shops. Many thanks, Mark. Q. Hi-I posted a couple of questions last week and have had no response. Can you send an answer pls? Q. Would you be able to provide projected revenue growth over the next 3 year period and the latest company valuations that were undertaken? A. Yes - we will send you our forecasts. Thanks for your interest. Q. Hi there, this looks very interesting but i would like to see the audited financials before committing, could you please send me the financials for the past 3 years? A. Sharif, please let us know if you have any further questions. We have sent you the accounts. A. Hey David, We will send you our forecasts which are based on having 2 shops. We will also send you historic accounts. We are from a finance background and manage the company finances with our accountant. A. Jayne, the exact address will be: 1, West Park Walk, E20 1DH, East Village. We will email the terms of the loan and forecasts. How will you maintain quality across the two stores? The Kitchen has relocated to the larger Stratford store (as we are expanding making ready for wholesale, push for B2B and catering). the ice cream will be exactly the same if not better and be delivered to the Covent Garden shop. The quality is vital and is part of the USP therefore will remain the same. It his based on the Slow Food concept and traditional way of making gelato without compromising on the ingredients (organic and natural), the love and passion for high quality gelato and the process. "We seek to make eating and meeting for a gelato and a coffee a social occasion for all seasons in a great environment."